Howard Schultz running as an independent for president could guarantee Donald Trump four more years in the White House. The consequential impact to our country will be severe. We cannot be passive. We must actively say #NoHowardNo. We must fight back. Join in our effort to emphatically let Howard Schultz know that he must abandon consideration to run for president as an independent candidate -- and to fight against him should he continue to run. 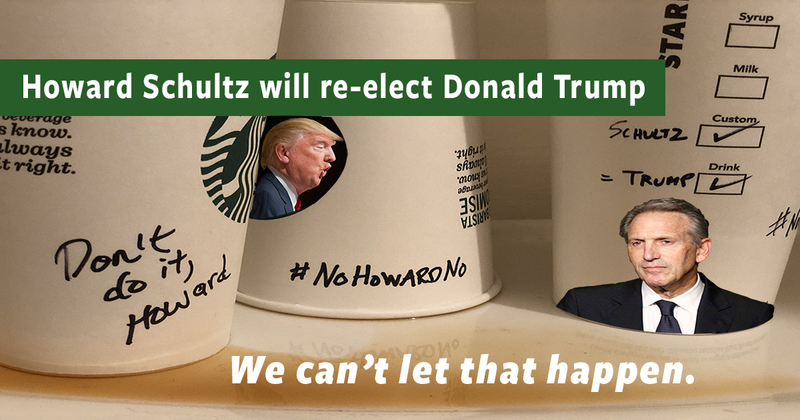 Howard Schultz has no chance to win but he does pose a serious threat to helping re-elect Donald Trump. We will fight.